A brilliantly funny look at the tumultuous recent past from the Pulitzer Prize-winning humorist. But what did happen? 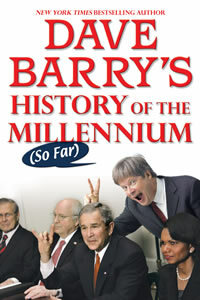 To provide a little perspective on a really messed-up millennium (so far), the one and only Dave Barry slips into his historian's robe (it's plush terrycloth) and revisits the defining moments in our country's recent history - from the Bush years to - jeez, it's still the Bush years! As an added bonus, Barry quickly - we're busy here - tosses in the complete history of the last millennium, covering crucial turning points such as the invention of the pizza by Leonardo da Vinci and the computer by Charles Babbage (who died in 1871 still waiting to talk to tech support).